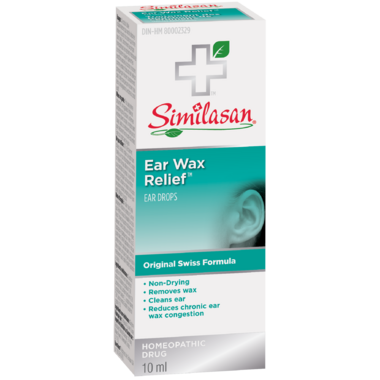 The homeopathic ingredients in Similasan’s Ear Wax Relief can help relieve the symptoms of chronic wax build-up, dryness, itching, clogged sensation, and ringing in the ear when caused by ear wax. Ear Wax Relief is glycerin based and is non-drying, which is important because dryness can compound the problem of itchiness and excessive earwax. Help your body restore balance with Similasan’s Ear Wax Relief ear drops. Uses: For occasional use as an aid to soften, loosen and remove excessive ear wax. According to homeopathic principles, the medicinal ingredients in this medication also provide relief from symptoms of excessive ear wax such as: clogged sensation when caused by ear wax; ringing in the ear when caused by ear wax; dry skin, itching or eczema of the ear canal. Directions: For use in the ear only. For adults and children over 12 years of age. Remove tamper-evident seal from neck of bottle. Twist cap off bottle. Tilt head sideways. Squeeze plastic applicator to release 2-3 drops into ear (applicator should not enter ear canal). Keep drops in ear by keeping head tilted or placing cotton in ear. Repeat as needed. Warnings: For external use only. Initial exacerbation of symptoms may occur. If pregnant, consult a doctor before use. Keep this and all medicines out of the reach of children. Avoid contact with eyes. Do not use: If you have ear drainage, pain, discharge, irritation, a rash in the ear, or are dizzy; consult a doctor. Do not use if you have an injury or perforation (hole) of the eardrum or after surgery unless directed by a doctor. Do not use for more than 4 days; if excessive ear wax remains after use of product, consult a doctor. This product works well and is not as harsh as others I have tried.